The first thing that struck me about Break was how nice it was to read a YA book that didn't revolve around or devote a huge chunk of itself to romance. Jonah already has a girlfriend, (well, kind of), and while he likes her a whole heap he doesn’t obsess over her or doubt her feelings or worry overmuch about the relationship or any of that standard YA jazz. 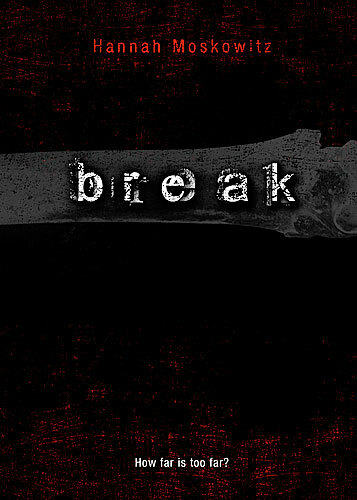 Break is a book hugely concerned with relationships, just not the teenagers in love kind. This a book about family. Jonah has a brother, Jesse, who is allergic to pretty much everything. Regular trips to the emergency room kind of allergic. Good chance of dying young kind of allergic. His parents weren’t coping so well with it before, and they’re coping even less now there’s a new baby in the house. It doesn’t help that milk is among the many, many, many things Jesse is allergic to, and with a new baby there’s a lot more of it around. 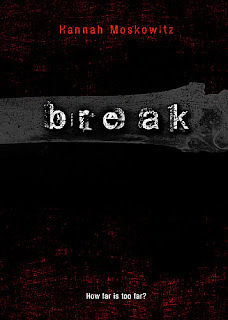 It’s a family on the edge of breaking, (that point between broken and unbroken is a running theme through this aptly titled novel) and Jonah is doing everything he can to hold it together. It’s a lot of stress for a 17 year old kid, which probably explains why Jonah has also gone a little bit nuts. So apparently when you break a bone it heals stronger. I don’t know if that’s true or not, but Jonah certainly believes it is, and that’s why he’s embarked on a mission to break every bone in his body. As crazy as this sounds Jonah actually has a well thought out system of logic behind his quest, and slowly figuring out where his mind was at with this was one of my favourite aspects of the book. (Hint: it's not as obvious as you might think). But still, ouch much? I don’t if the author Hannah Moskowitz broke a bunch of bones when she was a kid or maybe in the name of art she went out and broke a bunch for research, but she has the descriptions of it down. The anticipation of pain, the sick feeling, the crunch… It’s not so hard, I think, for an author to make a reader feels empathetic pain, but to make them feel physical pain along with the character… Moskowitza pulls it off, and I don’t know whether to be impressed or annoyed at her. There’s one scene where Jonah dives into an empty pool that made my heart physically race it was so awful. I don’t want to give the impression that the book is full of gore or going for cheap shocks, because it’s not like that at all. But it is definitely full on! Another thing I liked was the relationship between Noah and his brother. But then, I’m a real sucker for brothers. I liked the way Jesse was obviously so fed up with Jonah’s overbearing concern, but at the same time obviously cares about him and panics at the thought of being without him. Similarly I liked that Jonah cared for Jesse so much, but at the same time resented him just a little. Their relationship was complex and convincing. Less convincing were the parents. I had trouble accepting that they could be so very bad at looking after Jesse and dealing with his allergies. Or that they could be so blind to the fact that their other son was regularly doing himself serious damage. It’s not that I doubt such parents exist, they just seemed to be a bit over the top with their failing in this book. I also had some issues towards the end of the book. (No spoilers, I promise). Jonah starts to unravel, and really strange things start to happen. I initially thought it was an excellent example of an unreliable narrator, that Jonah was really, really losing it and his perception of reality was slipping. But by the end of the book this appears to have not been the case, which kind of ruined things for me a bit. I mean, some of these things were really bizarre or just straight up weren’t explained at all.The ending is really abrupt, so maybe that's where my issue lies. Things went nuts and then things just ended. Moskowitz had a really tight hold on the plot for the first three quarters of the book, so it was a shame to see it unravel all over the place like it did at the end. Despite this, I still found Break to be highly engaging and also very, very interesting. I recommend it, especially if you're looking for a YA read that isn’t all about the make outs.